Thomas K. Schulz, M.D., is director of the newly accredited internal medicine residency program on UAMS’ Northwest Arkansas Campus. Sept. 29, 2015 | LITTLE ROCK – The University of Arkansas for Medical Sciences (UAMS) received accreditation Sept. 23 for an internal medicine residency program at its northwest Arkansas campus in Fayetteville from the Accreditation Council for Graduate Medical Education. The first eight resident physicians will arrive in July 2016 to serve their residencies at Mercy Health System Northwest Arkansas in Rogers and at the Veterans Health Care System of the Ozarks in Fayetteville. The postgraduate program will admit eight physicians annually for a three-year specialized residency where they will strengthen their skills caring for patients under supervision of experienced physician specialists. “Establishing an internal medicine residency here was a major goal we had from the very beginning of this regional campus in 2007 and it is a credit to good work by so many — including our clinical partners at Mercy Health and the Veterans Health Care System of the Ozarks — to reach this point,” said Peter O. Kohler, M.D., vice chancellor for UAMS Northwest Campus. In addition, the residents will see patients at a new UAMS Northwest Campus outpatient clinic opening for the program next year. 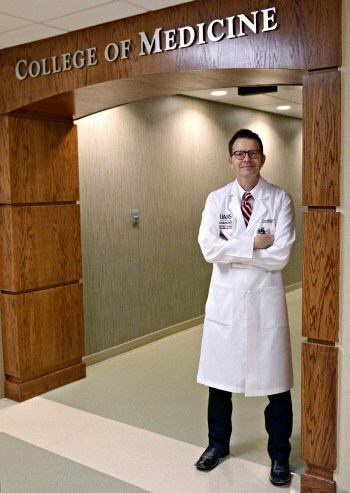 “Internal medicine is a major primary care need in Arkansas — especially in rapidly growing northwest Arkansas — so this program enables us to begin addressing that need by increasing the number of internal medicine physicians starting their career there,” said UAMS College of Medicine Dean Pope Moseley, M.D. UAMS already has 30 family medicine and two psychiatry resident physicians in the region. The regional campus also has 201 students in medicine, nursing, pharmacy and the allied health professions — including the first 24 students in the physical therapy program that started classes in August. The Veterans Health Care System of the Ozarks will host three residents. “The Veterans Health Care System of the Ozarks is glad to serve as a clinical host for UAMS resident physicians, a partnership we believe will help the veterans we serve and those physicians serving their residencies with us,” said Mark A. Worley, M.D., interim director, Veterans Health Care System of the Ozarks. Internal medicine specialist Thomas K. Schulz, M.D., joined the UAMS faculty in January 2015 as director for the internal medicine residency program. He said he expects the program will start receiving applications from fourth-year medical students within days. Interviews will follow, with the program submitting its preferences to the National Residency Matching Program. Residency matches are announced simultaneously across the country to thousands of medical students on Match Day each March. Internal medicine residents in northwest Arkansas will be able to connect with the internal medicine residency program based on the UAMS main campus in Little Rock via interactive video for conferences and regular educational presentations. They also will be able participate in elective rotations and fellowships on the main campus, further expanding access to specialty training for the residents. To gain accreditation, Schulz said, information was required on every aspect of the program. “We had to show that we could offer a viable curriculum and teach internal medicine at a level that would enable our residents to pass the certification exam,” he said.